Korea Investment & Securities Co. (KIS) emerged as the top company in the area of return on equity in the securities industry in the first half. 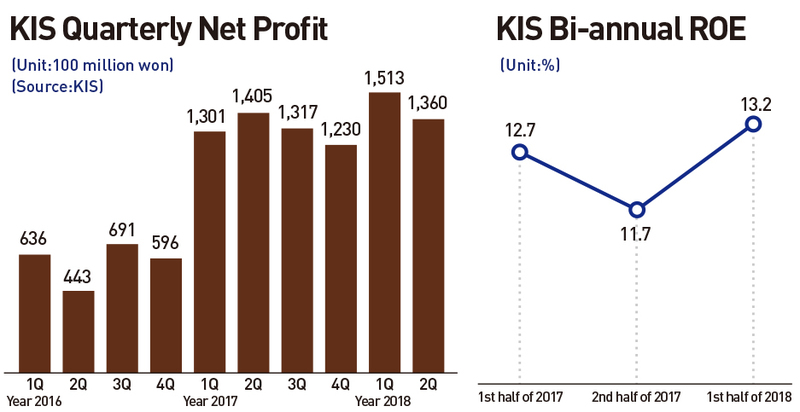 KIS recorded a ratio of 13.2 percent on operating profit of 378.2 billion won and net profit of 287.3 billion won, doing its job fully both at home and overseas as a leading IB firm, the company said on Aug. 13. The H1 net profit rose 6.2 percent YoY and was the largest net profit ever by an IB firm in the first half among IB firms. KIS was followed by Meritz Securities with an ROE ratio of 12.7 percent and Korea Financial Investment with an ROE ratio of 11.3 percent.KIS was able to get the best results from all of its operational sectors, including consignment sales, asset management, investment banking, and wealth investment. The consignment unit posted pre-tax sales of 142.1 billion won, up 42 percent YoY, and the investment banking sector also boosted its sales 32.7 percent YoY to 154.5 billion won while the asset management and asset operation sectors had their net profit rise 21.1 percent and 15 percent YoY, respectively. In the first half, securities firms have been able to do very well in the fee earnings dep’t, with the funds for stock transactions rising substantially to share some 30 percent of their total earnings. But KIS has been able to see its fee earnings share only 20 percent of its total income in H1. President Ryu Sang-ho explained that the consignment sales and fee earnings were rather low compared to other companies in the market, but KIS made up for it by doing exceptionally well in other sectors like the share trading, investment banking and asset operation and management achieving balanced results creating synergy among them. Many securities firms hold a gloomy outlook for the second half due to the trade war between the U.S. and China. But KIS projects it will do well regardless, counting on its IB and sectors overseas. In November last year, KIS for the first time in the securities industry, won a license to engage in short-term financial operation and is ready to start issuing short-term notes, take over commercial papers, make corporate loans and buy long-term corporate bonds, enabling the company to take up fund management. As of the early this month, the company had 2.7 trillion won in outstanding notes increasing steadily to occupy its place as a new profit source for the company. KIS has been speeding up its overseas operations in the first half. The company named its Indonesian securities firm Danpac Securities as KIS Indonesia and launched its operation. 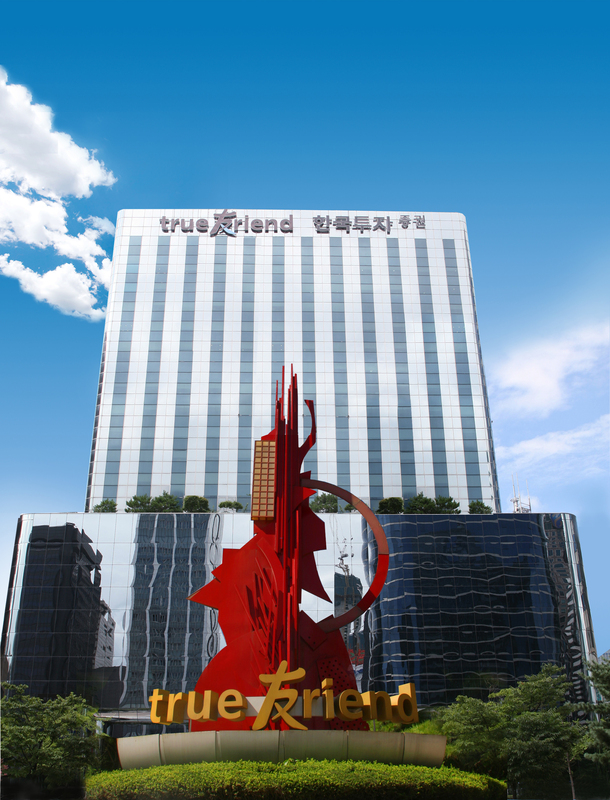 KIS Vietnam, set up in 2010, had its capital increased by 38 billion won thru the issuance of new shares to total 93.5 billion won. That makes it the 8th largest in the country. Last month, KIS Vietnam became the first foreign securities firm to engage in Vietnam’s derivative products market. President Ryu said he will see that the company solidifies its overseas operation by boosting its investments in the securities markets in the S.E. Asian region to become a leading IB in Asia. KIS Vietnam Securities Corporation, Research Division is a research firm. The firm covers consumer goods; industrials; financials; consumer services; basic materials; technology; health care; oil and gas; utilities; and telecommunications sector. It also covers index including HNX and HSX. The firm offers market daily commentary, investment strategy report, technical analysis report, company and sector report, and macro and market report. It also offers corporate data; and trading data including trading history, stock filter, comparison tool, and industry analysis. KIS Vietnam Securities Corporation, Research Division was formerly known as Empower Securities Corporation, Research Division and is based in Ho Chi Minh City, Vietnam. It is a division of KIS Vietnam Securities Corporation.